Developing countries have for many decades waged a campaign for the global regulation of trade in primary products through international commodity agreements. Heavily dependent upon exports of primary products, developing countries hope to regulate the markets for their commodities to achieve higher prices. While there is a myriad of obstacles to agreements, the blame for slow progress is often laid at the feet of the industrial, commodity-consuming countries, particularly the US. 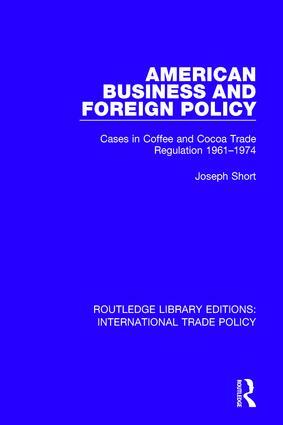 This book, first published in 1987, is a comparative case study that closely analyses how American businesses behaved in relation to US government responses to developing countries’ demands for commodity agreements for coffee and cocoa.